So, it happened again. I went three weeks without a post. Ugh. I’m a terrible blogger! What have I been doing all this time? A little bit of everything. It’s been HOT lately. Like, I mean, I sweat just looking out the window while sitting in the AC at work. I don’t have AC (or even a fan) in my little workshop, so it’s pretty well miserable out there working in sawdust and paint and who knows what else. That being said, I’ve been slacking. I did manage to touch up some paint spots in the kitchen and hallway one day, though (in the AC:) ). That’s exciting. I’ve also made some planters for my front porch, a table for my sister to go with the Adirondack chairs I made her a while ago, a house for our kitties, and we cleaned up a tree that fell in our yard and dug up some bushes that needed to go. Oh yeah and I made my parents a set of corn hole boards, a couple “mail organizers”–one for me and one for a friend… ANNNNND I burnt up my table saw. So I guess I haven’t been TOTALLY slacking….I just haven’t felt anything I’ve done was blog worthy. Looking back, umm, I guess a lot of that was, I just didn’t take good pics to post. Oops. 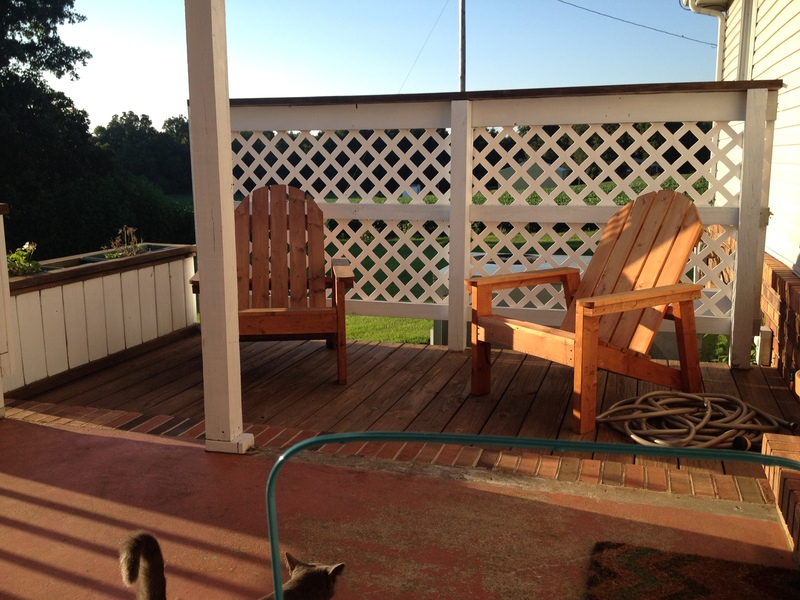 So let’s move on to my latest project that I have finally completed–our back deck. I have been working on it since Memorial Day! It’s now mid August. Wow. 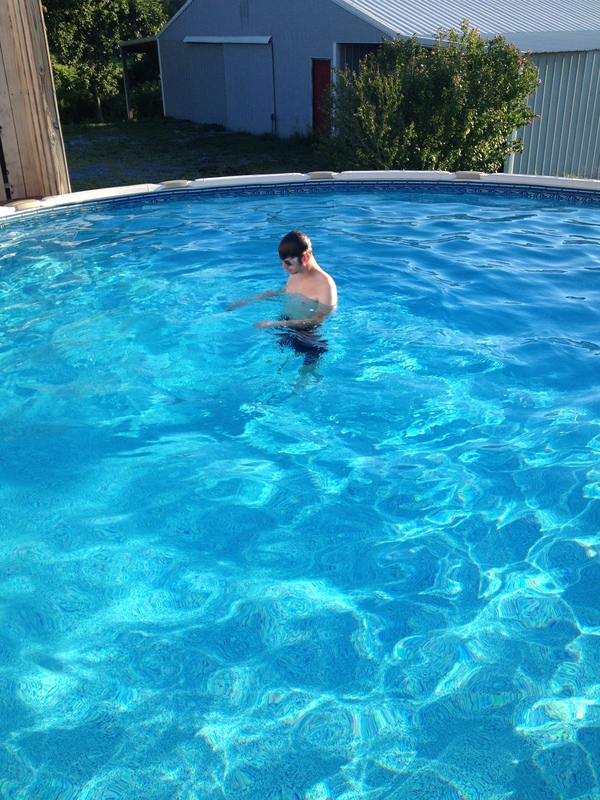 We have a pool in the back of the house and it looks like a great place for a party (hence the title of this post). Bad news is I hate cleaning (both before and after) a party so we don’t have any haha. Hey, every day when I come home from work is a party to me. 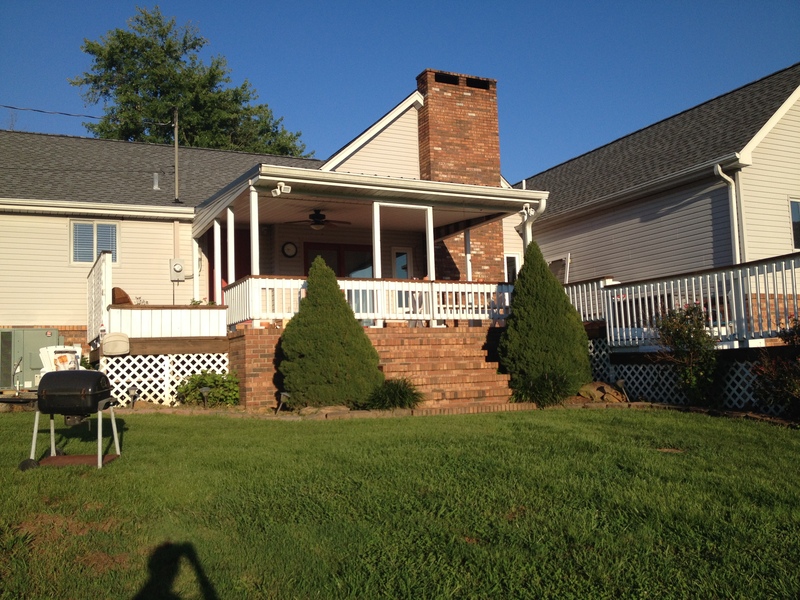 Nice space, nice porch, nice yard, nice pool. I can’t complain. 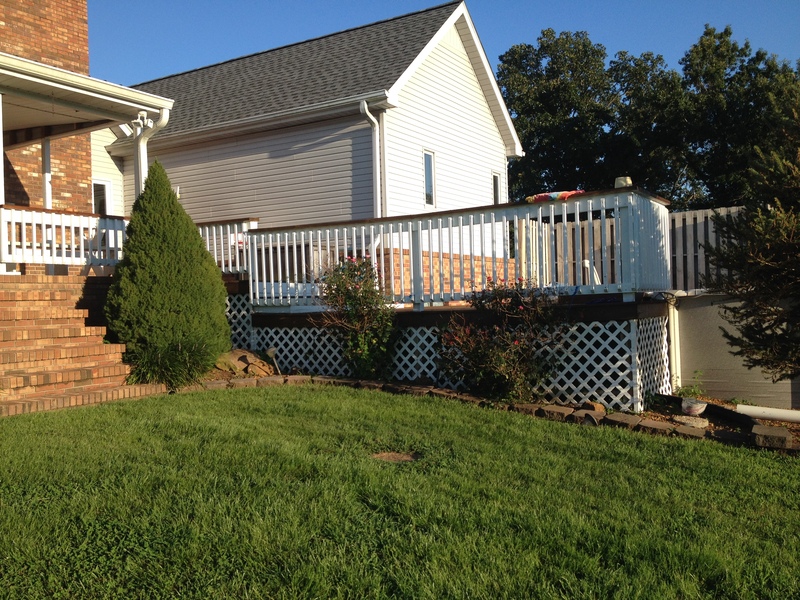 My only issue is that the deck is a little weathered and a little….umm green? Ew. My first thought was “how do you clean this?” Then, “let’s stain it a pretty brown.” Then, “what about the rails?” See how things quickly escalate? 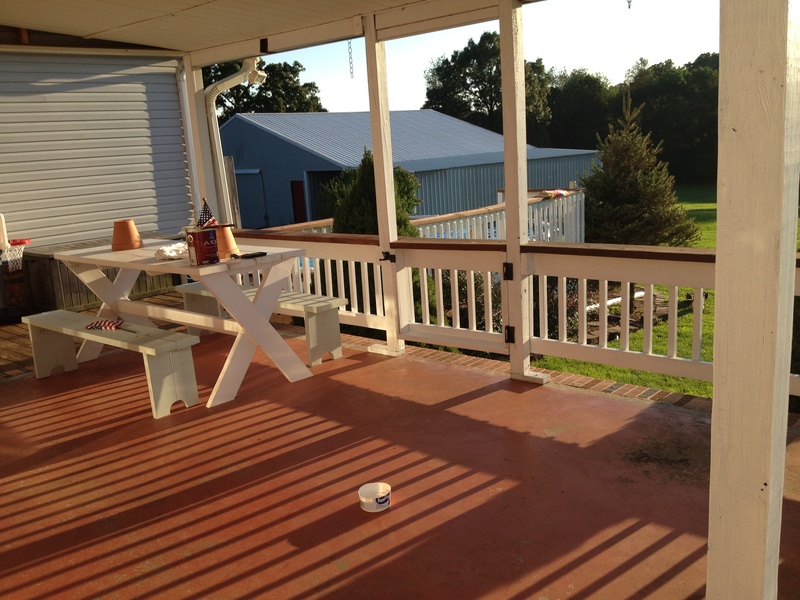 Long story short, we decided to stain the deck and rail ledge (not sure that’s the right term) and paint the railing white. I did not know it would be this much work when I started. I would probably not have done this if I had known that then haha. I spent a couple weekends cleaning the deck. Let me tell you, unless you use name brand bleach in a 1:1 mixture with water, then don’t even bother. Trial and error taught me that. Take my word for it. Deck cleaner worked well, (I tried it) but bleach is much cheaper 🙂 I put it in a garden sprayer and went to town on the deck. IT WAS AWESOME!!!! I wish I had taken a video of it to show you, but I was seriously so engrossed in spraying that I couldn’t stop. It was like magic. 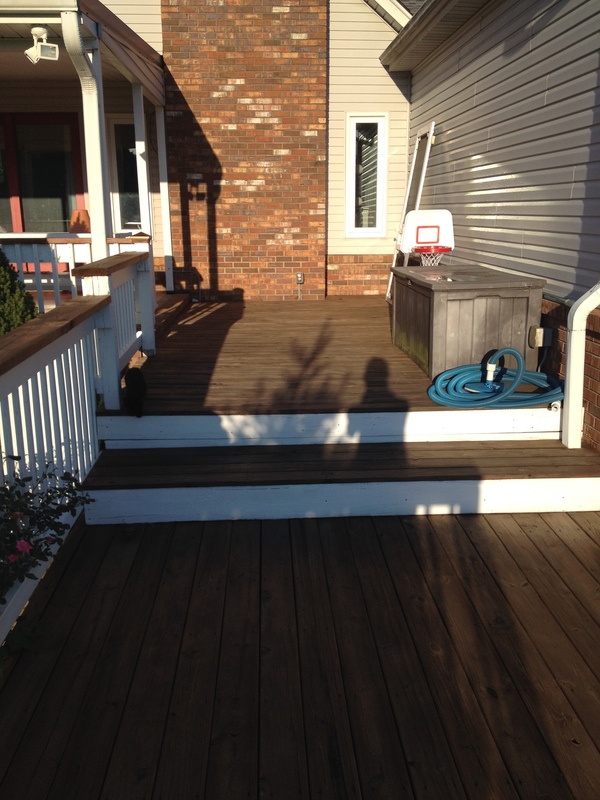 Everywhere the deck was grey or green or dark black (mold) just disappeared when you sprayed it! Like within seconds, I’m serious. 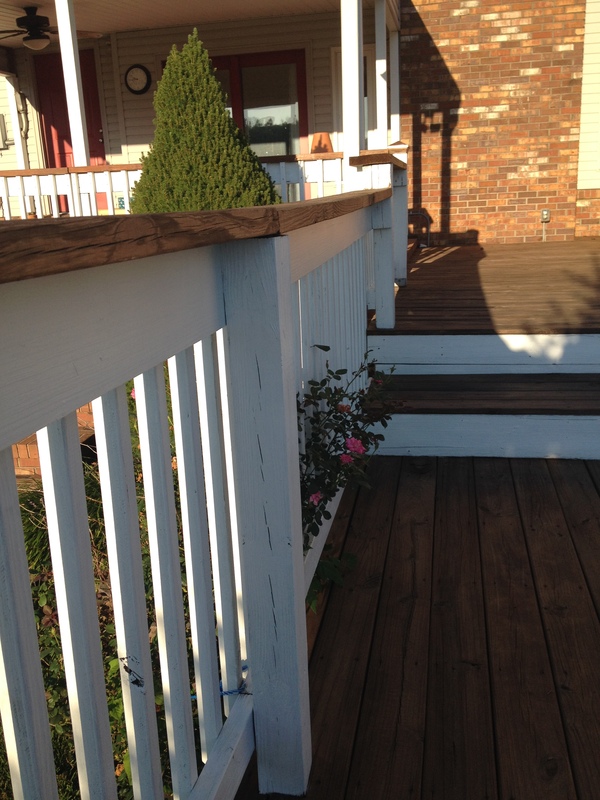 If you notice in the before pictures, one part of the deck rails are one color and the other rails another color. 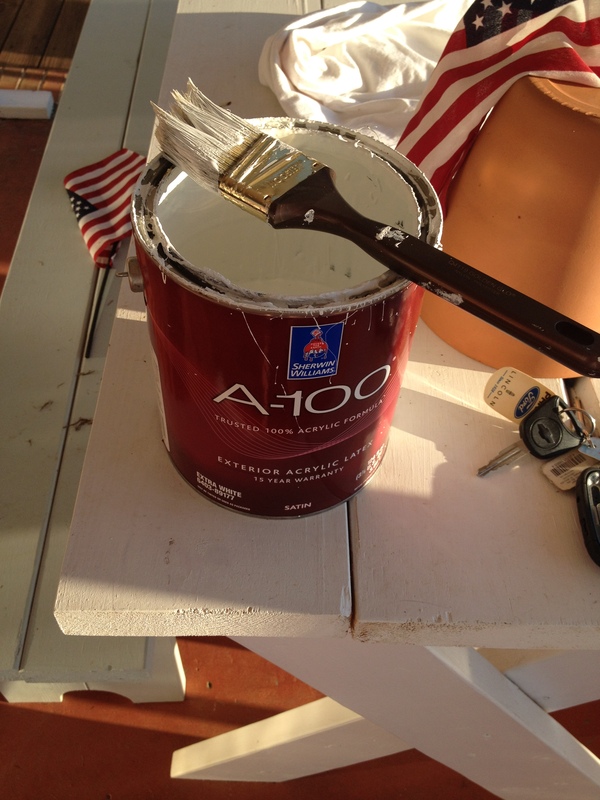 By the time I got done, it all looked like brand new wood–well color-wise. The condition was still weathered, and cracked a little–that’s just part of it. I wanted something BROWN. I am not a fan of orange-y stains. 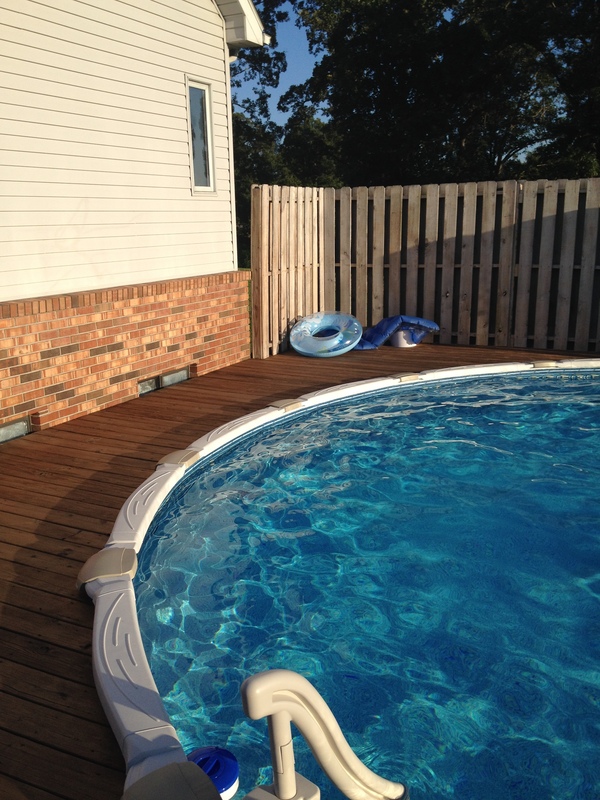 I also didn’t want a solid color–I wanted STAIN–I wanted transparent so you could see the wood grain….as ugly and weathered as it may be haha. 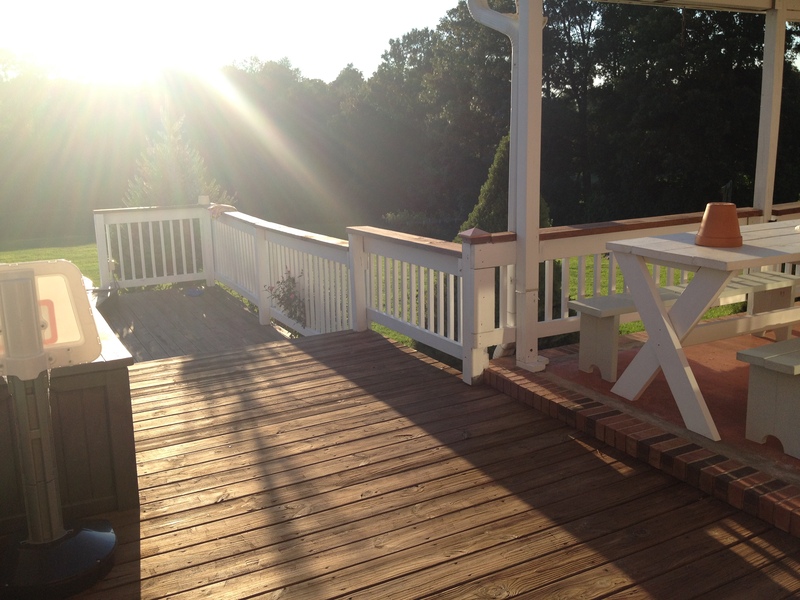 I used a large brush and brushed every square inch of the deck and top ledge of the rails. 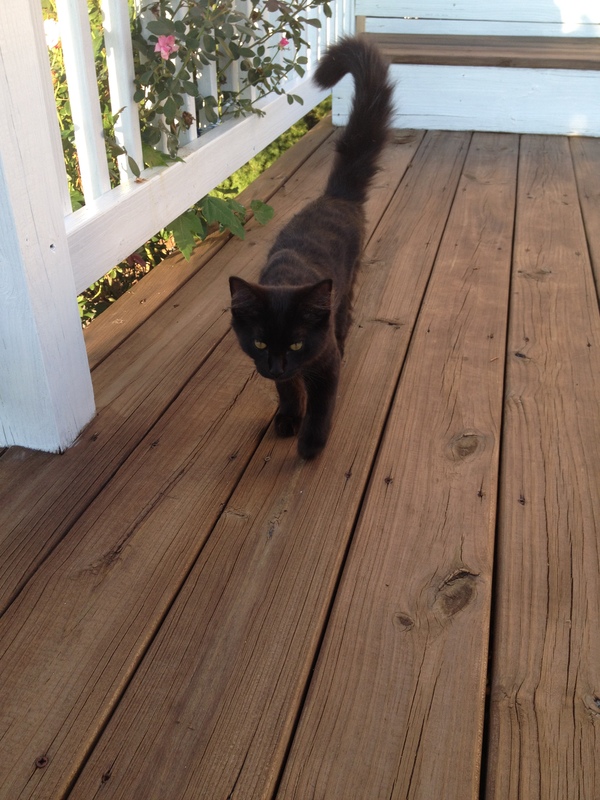 Once the deck was stained, I moved on to the railings. I expected painting the deck rails to take a couple days max. Boy was I wrong. It took me SEVERAL days to get one coat of primer on them. Then ANOTHER several WEEKS to actually get the paint done. Now, granted, I wasn’t doing this 24/7. But I would spend a few hours here a few hours there–when it wasn’t blaring hot outside. UGH don’t ever paint deck rails with a brush!! This is just the beginning of the projects to be done out here. I LOVE the white rails and warm stained wood, but this space needs some help still. I hate this red/orange-y stain on the concrete, but that project will have to wait until another year. And I can’t decide to keep this table or not. It’s cute, but it doesn’t seem to fit very well. It’s just an awkward layout. And the big plastic storage thing will eventually be traded for a big wood box or something prettier…I just haven’t gotten around to making it yet. And the fence by the pool will be redone somehow differently for next year. 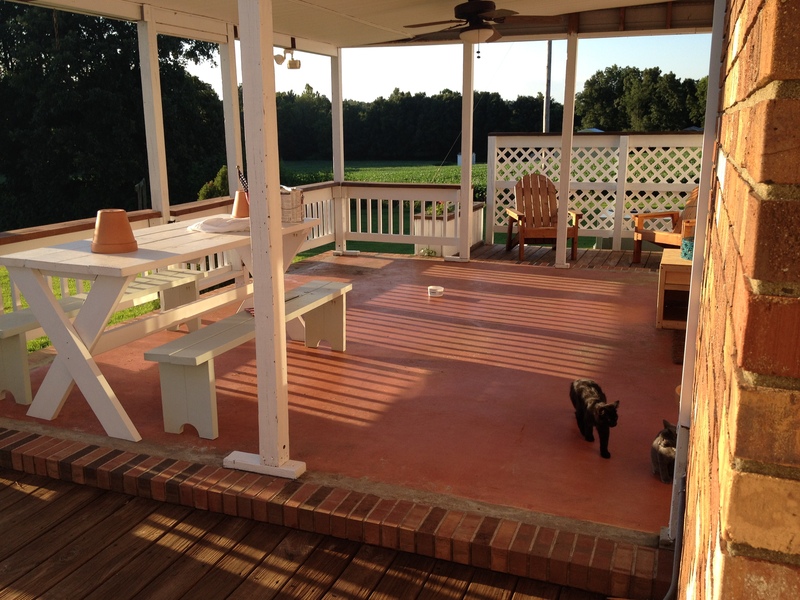 For now, we will have to settle for painted deck rails and fresh stain 🙂 But keep your eyes out for MANY more updates to our outdoor space over the next few months (or more likely) years. It looks great! And my hands hurt just thinking of brushing paint on all those rails. You go, girl! You are very, very talent and creative. I simply love everything you have done. I am so happy I stumbled upon your site and was able to subscribe to your site. Thank you so much for sharing. Thank you! That means so much to me! I’m glad you enjoy the site 🙂 I hope you keep in touch!